Available in packs of five for Singles, Doubles, Triples, Impact Doubles and Impact Triples. Not much to say about chainring bolts but that they do the job. I have had problems with other manufacturers in the past with chainring bolts loosening over time. These do not do that. It is nice to have them use a standard allen key on one side rather than the star shaped key required for some. You still need the much hated chainring bolt tool for the other side though. Are the Stronglight chainring bolts for a double engraved? The double bolts are not engraved. I'm looking for a set of chainring bolts for a triple chainset, to go with the Spa Cycles touring cranks, that have four arms visible and the fifth bolt captive inside the crank arm. This is the same as the old-style Impact crankset from Stronglight. Is the "Impact Triple" set of bolts compatible (i.e. does it have a captive bolt)? Unfortunately these bolts do not contain one suitable for use with a captive crank nut. The only set we have with a bolt of this type is the Brompton set (SJSC part 31176) but the other bolts are designed for a single chainring so won't be suitable. 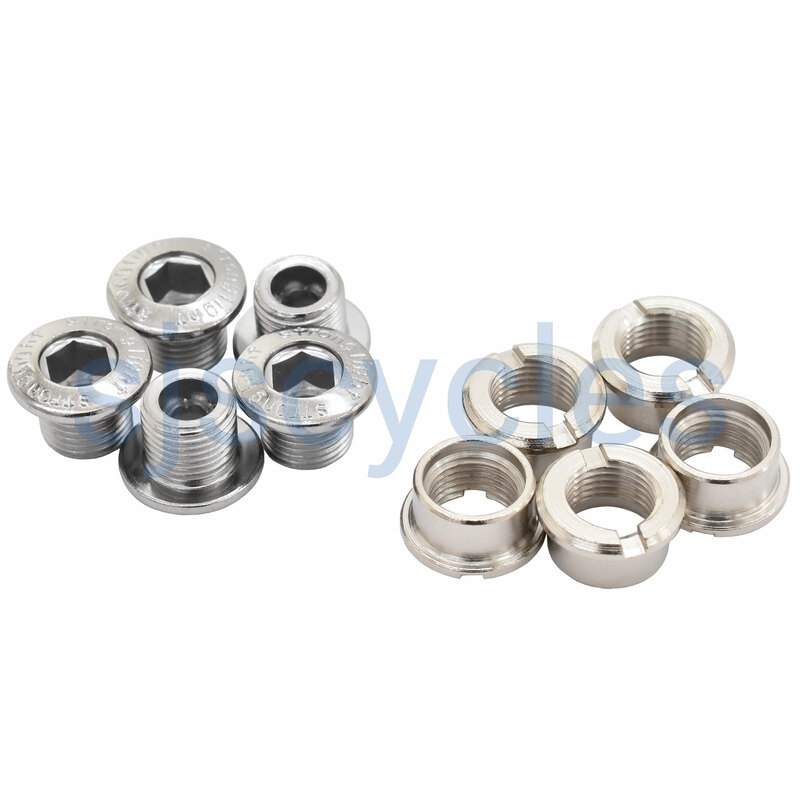 Are there bolt set for shingle having less than 3.5mm length and less than 9mm outside diameter nut. My Old Stronglight TS has 3.5mm thickness and hole size is 9mm. Unfortunately we don't have chainring bolts that will fit your required dimensions, all of our chainring bolts are 10mm in diameter and even the shortest single ring bolts are over 4mm long I'm afraid. Noticed one of mine was missing, would these fit? are the singles the right ones for this crankset? The single bolts should work as a suitable replacement for the bolt originally found on your Stronglight 2000 chainset. I'm looking for bolts and peg to fit old double Campy crankset. Pegs should be 8mm OD body , 10mm OD head , 10mm long, M6 thread. Do you have anything like that available? We don't have any chainring bolts that are specific for Campagnolo chainsets, if any on our website look similar then they should fit and work but I can't suggest anything specifically for your chainset I'm afraid.